I want to create an application, where it downloads bar location and some necessary details such as price of a beer, location and last call time. Also, I want it to be plotted with the user's current GPS location. Also, I want to have a server where user's can upload their recommended bars so that other user's may see it on their screens. But for this tutorial, I just want to implement #2, since I still can't find a nice free server to host my server app. - this is just a POJO for the Bar Details. It also stores the longitude and latitude values of the Bar. - contains the method to retrieve a List of Bar Details. Currently, the implementation is just hard-coded and will be replaced on the next iterationsof this application. 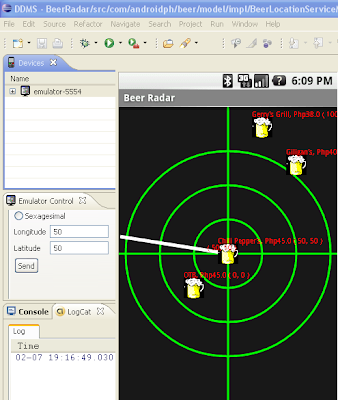 - Just create a java.util.List and add BeerLocation to the list. - Extend the android.view.View class. The View class contains the onDraw(Canvas) method which is where the painting is done. The onDraw(Canvas) method is similar to the paint(Graphics g) of AWT and/or Swing components. Even the draw methods are almost the same. (example. g.drawArc(...), canvas.drawArc(...), g.drawLine(...), canvas.drawLine(...) and so forth. The only difference is that the canvas stores most of its paint/draw properties in a Paint object. - The Paint class stores common drawing properties such as color, font size, stoke etc. - The coordinates are also the same for both canvas and graphics. 0,0 is the upperleft-most and MAX_WIDTH, MAX_HEIGHT is on the lower right-most. - Just plot two lines that looks like a corsair. - This uses the canvas.drawCircle(...) which actually is not on the graphics class. The canvas.drawArc(...), is different from the drawCircle, since it uses a RectF to get the size of the arc/ellipse to be drawn. Where A is the amplitude. - Since I am using 0-360 degrees for the angles, it is necessary to convert degrees to radians. STEP 5. Plotting the BeerLocation data. Since the screens midpoint is not 0, the longitude must the adjusted. The + (positive) value of X should be in the WEST part of the screen. So the midpoint of the X-axis must be added to the location's longitude. Also, to adjust it to the user's current location, the currentLongitude is subtracted. The BEER_ICON_SIZE is subtracted just so it becomes centered. There's a slight difference between the computation of Y, since the + (positive) value of y should be on the NORTH part of the screen, thus, the point is adjusted. So, midpoint of Y is subtracted with the beer location's latitude. Also, the currentLatitude is added to the equation. - The maximum coverage is not yet adjustable yet. In the future, I'll modify so that the user can select a minimum radius of 1KM and a maximum radius of 10KM. I currently do not know how each degrees of the longitude and latitude translates into KM. I'll research on it first. STEP 2. Create a android.os.Handler that invalidate's the view when called. Invalidate is similar to calling awt/swing component's repaint() method. "When a process is created for your application, its main thread is dedicated to running a message queue that takes care of managing the top-level application objects (activities, intent receivers, etc) and any windows they create. You can create your own threads, and communicate back with the main application thread through a Handler. This is done by calling the same post or sendMessage methods as before, but from your new thread. The given Runnable or Message will than be scheduled in the Handler's message queue and processed when appropriate." - Implement the necessary methods. Thanks for the nice tutorials! Q: How do you get the emulator to attach inside that eclipse window? Mine is always separate so I spend all day moving windows around so I can see it. I never had this issue before. Might be worth to ask this in Android Forum. I loaded the source code, but keep getting an error that forces it to quit. What am I doing wrong? Thanks. Hi can you share the full source code for this.the link is broke.